Husky 4.6 gallon air compressor is a brand new air compressor made by Husky. This unit is one of the quietest compressor in the air compressor world. It’s ideal for home usage and it can do for you almost any task. Husky 4.6 gallon compressor is built with a powerful 1.0 HP motor to ensure reliable operation. It delivers 3.03 CFM at 40psi, 2.1 CFM at 90psi and its maximum pressure is 125psi. This is really quiet air compressor, its maximum noise level is only 65 dB. Just imagine the noise level of electric shaver is about 60 dB! You may think how they achieved such great results? Well, Husky used special 1 HP motor for this compressor which operates at only 1680rpm. Due to this, Husky 4.6 Gal Air Compressor creates less noise, has less wear, and it has much longer life cycle. It has twin air tanks made of aluminum therefore it does not corrode unlike steel tanks. The Weight of Husky 4.6gal compressor is only 49 lb., so it’s lightweight enough to be moved it without any problem. In addition, it has oil-free pump which is greatly reduce its maintenance and you do not need to think about oil change. As you may see, it has two 1/4 inch quick connectors on the control panel, therefore you can use 2 air tools at the same time. 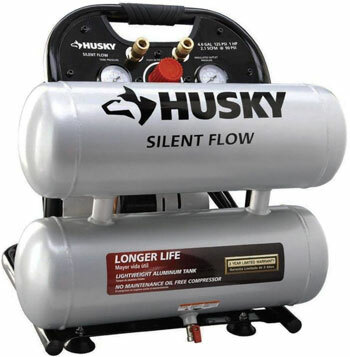 Husky 4.6 gallon air compressor can be in two colors gray or black. If you are looking for some disadvantages of Husky 4610A model than we must say that it has one. Unfortunately, it does not have wheels for transportation. But its benefits allow to accept this drawback. You can say that it very similar to CAT-4610A 4.6 gallon air compressor by California Air Tools. Yes you are right, but 4610A by Husky almost 2 times cheaper than CAT-4610A.